FUJIFILM North America Corporation, Graphic Systems Division will be featuring a powerful line-up of innovative solutions within digital, flexo and hybrid printing at Labelexpo Americas, September 25 – 27, 2018, at the Donald E. Stephens Convention Center, in Rosemont, Illinois. 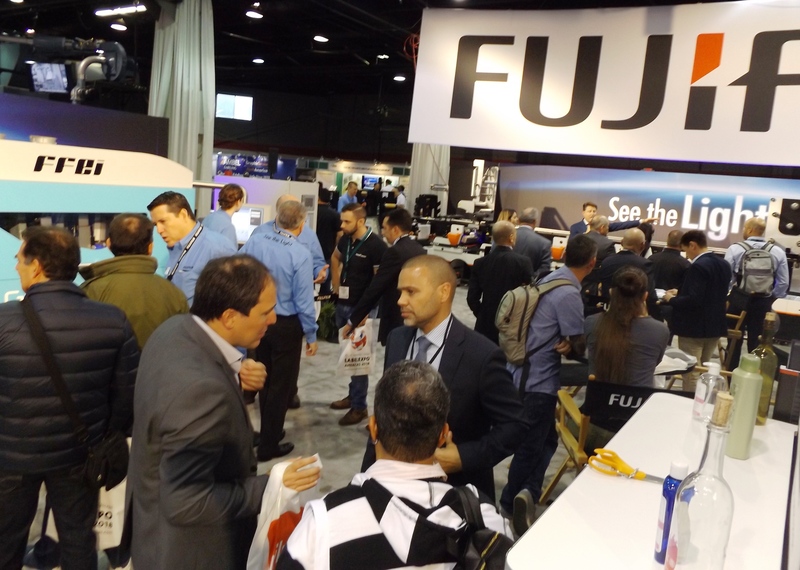 Throughout the three-day event, attendees will experience live presentations and hands-on demonstrations within Fujifilm booth # 5621, including the new GraphiumX, a UV digital hybrid inkjet press; the new Graphium Printbar; the new Edale FL3 narrow web flexo press, pictured right; new FLENEX FW-L2 Platemaking Technology with the C-Touch 2530 Water Wash Plate Processor; the new Illumina COLDCURE LED UV Curing System; 300 Series LED UV flexo inks; and ColorPath® SYNC™ color management software. Fujifilm GraphiumX—Digital hybrid inkjet label press enabling printers to embrace the complex demands for high quality and differentiation for shelf appeal with a range of finishing embellishments, all in best-of-class single-pass hybrid printing platform. Graphium Printbar—New UV inkjet imprinting bar system that is a highly flexible and complete inkjet solution that can be easily integrated onto a wide variety of analog and digital presses and converting equipment to add single-pass digital printing capability. Edale FL3 Press—Highly productive and high quality flexographic label and packaging printing press with fast change over and automated registration that is extremely cost efficient and meets the demands on narrow web convertors to deliver increasing numbers of short run jobs across a wide variety of segments. FLENEX FW-L2 Water Wash Flexo Plates—High quality digital and analog flexo plates that provide the highest flexo print quality at the fastest processing times, while significantly lowering cost-in-use compared to thermal, solvent or other water-wash technology. C-Touch 2530 Water Wash Plate Processor—Industry leading waterwash processor designed specifically for use with Fujifilm’s FLENEX plate. These processors are designed for ease of use and enable the fastest and most consistent flexo plate processing in the market. Illumina COLDCURE LED UV Curing System—Fujifilm’s new Illumina LED UV retrofit system converts virtually any traditional UV or waterbase flexo press to LED UV curing, typically in a day or less and delivers incredible productivity and cost-saving benefits. 300 Series LED UV Flexo Inks—Fujifilm’s 300 Series LED UV flexo inks are designed for use with all common flexo substrates. This ink series offers the ability to cure with traditional UV or LED sources with the same high quality ink. ColorPath SYNC Brand Color Optimizer—Another cloud-based feature added to the ColorPath SYNC family of solutions allows for prediction, creation and optimization of brand color libraries and spot color simulations on inkjet and digital printing systems. It provides industry-leading conversions of named colors with accuracy, speed, and ease of use. Plus, it’s fully Pantone® licensed in the cloud. For more information about Labelexpo Americas 2018, please visit: www.labelexpo-americas.com.